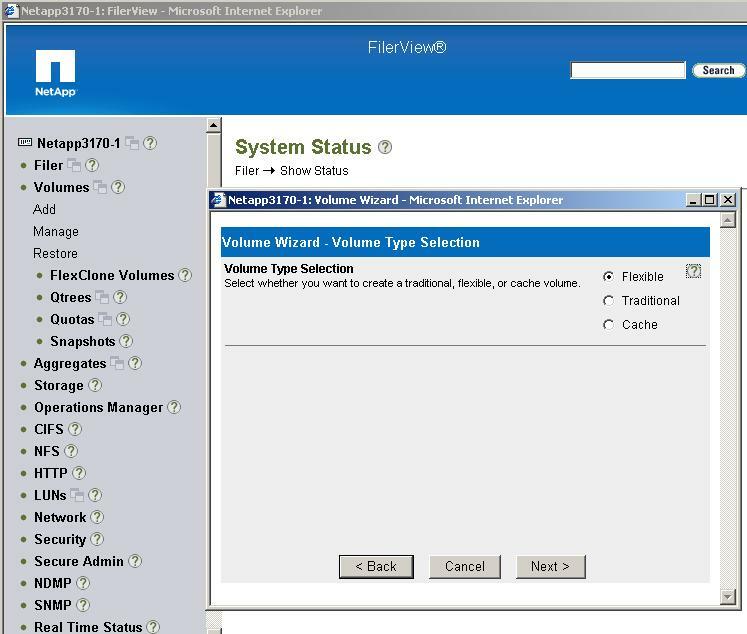 NetApp FAS3100 Series can be accessed by NetApp System Manager (GUI based management tool), FilerView through Web browser, and CLI through (telnet or ssh). This configuration guide is for FilerView. Click on FilerView icon (left pane) to open FilerView window. Note: “vol0” already exist, this is the root volume. -> next screen, Volume Wizard – Flexible Volume Parameters, select the Containing Aggregate. -> next screen, Volume Wizard – Commit, Review the summary and click Commit. Initiators: Enter a list of initiator Â name, a list should appear, click the “Add” button. – Locate the intended LUN. – At the far right column, Maps, click on “No Maps” to open LUN Map window. – Select Initiator Group from the list box on the right, then click the Add button. – Enter the LUN ID (Start at LUN 0). – Click Manage LUNs at the upper left corner. The initiator should be listed in the Map column.